AF Rivers-Fletcher in a letter to MotorSport in February 1976 relates his experiences with this car which Howe acquired after Rudy Caracciola’s victory in the 1929 TT at Ards, Northern Ireland. The great German won the 30 lap race with a 5 lap handicap in a rain storm. Fletcher wrote the letter in response to Bill Boddy’s article some months before comparing the Bentleys and Mercedes in the 1920’s and 1930’s. Fletcher ‘having been at different times, closely involved with both camps, Bentleys and Campbell/Howe Mercedes, found his allegiance torn’. His impressions and recollections make very interesting reading. ‘I first drove some of the cars-Le Mans 6 1/2 litre Bentleys and Earl Howe Mercedes more than 40 years ago..’and in more recent times. ‘Even more revealing was being driven by Barnato, Birkin, Campbell and Howe in the very cars at the time of their racing success. 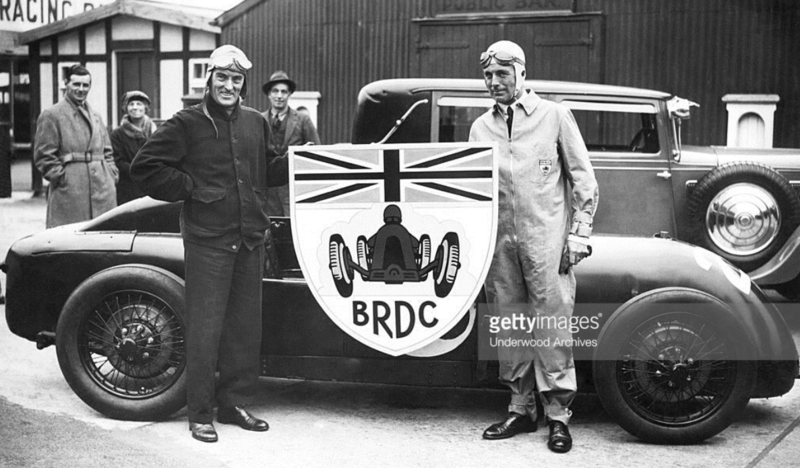 Regretfully, however i never rode as a mechanic in the Mercedes or Bentleys…watching as an apprentice with pangs of enyy during practice for the Brooklands Double Twelve as Wally (Hassan) jumped down into Barnato’s Speed Six Bentley to ride with him as a mechanic’. Fletcher; ‘After Caracciola’s epic victory with the 38/250 Mercedes SS in the 1929 TT, Lord Howe bought the car and raced it for several seasons. I drove it several times, once on quite a long run with Leslie Callingham of Shell…it must be remembered that Malcolm Campbell and Lord Howe ran their Mercedes in sprints and hillclimbs as well (as long distance races). They were very successful in spite of the brakes, the ‘achilles’ heel of the racing Mercedes.’. ‘…i always thought one of the best performances of Lord Howe’s Mercedes was its run in the 1933 Mille Miglia. Driven by Penn-Hughes and Percy Thomas (Lord Howe’s excellent mechanic) the Mercedes was in fact acting as the tender car to the ‘old mans’ successful MG Magnette team. It was loaded with MG spare parts under the tonneau’. Fletcher then compared the Benz with the Bentleys of the day; ‘The Bentleys particularly the 6 1/2, felt a good deal bigger than the Mercedes, perhaps because you sat so much higher in the Bentleys. Comparing the cars is very difficult because they felt so entirely different. Despite the record i still feel the Mercedes was pre-eminently a sprint machine with ‘bottom-end’ performance. The very light steering, terrific getaway aided by the unique blower installation and the compact feel of the car all made the Mercedes an ideal car for tight circuits and the hills-despite those brakes’. ‘The Bentley was a long distance car with ‘top-end’ performance. With its heavier steering it felt incredible sure footed. It needed more thought in deciding on a line through a corner, but was, i believe, quicker on the faster swerves than a Mercedes. The getaway from rest and from tight corners was slower than the Mercedes, but it made up for this by having tremendous torque in the middle and upper ranges. The ‘big 6 Bentley’ really accelerated between 70-100 where the Mercedes lagged a bit unless the supercharger was used all the time, which was seldom a proposition for long periods. The Bentley brakes were always excellent, with SO little fade, despite the considerable weight’. 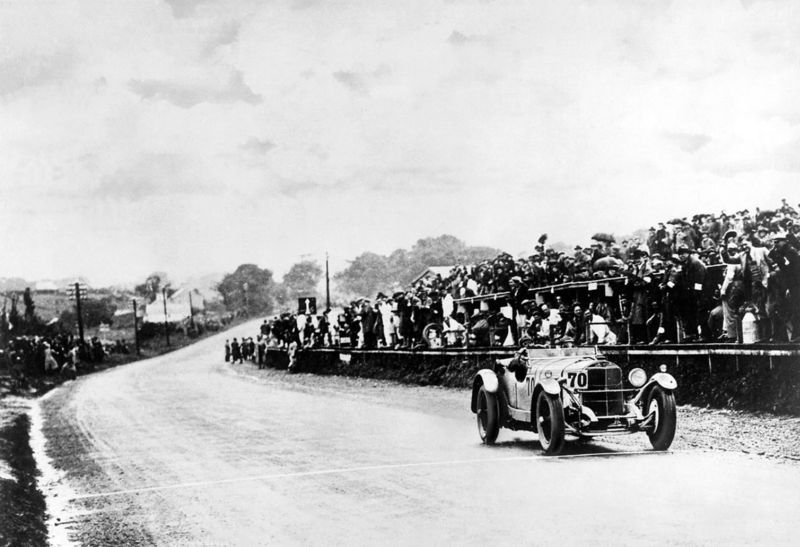 The Irish Grand Prix format from 1929-1932 comprised two handicap, 300 mile races each year with a formula determining the overall winner of the GP. The ‘Saorstat Cup’ was run for cars under 1500cc on the Friday of race weekend and the ‘Eireann Cup’ for the over 1500cc ‘heavy metal’ on the Saturday. Phoenix Park, the venue is just west of Dublin’s City Centre, the circuit was first used for racing in 1903 and was 6.8 Km long at the time. The 1930 races were won by Victor Gillow’s Riley 9 Brooklands with Rudy Caracciola’s Benz SSK taking out the over 1500cc event and awarded the GP itself. 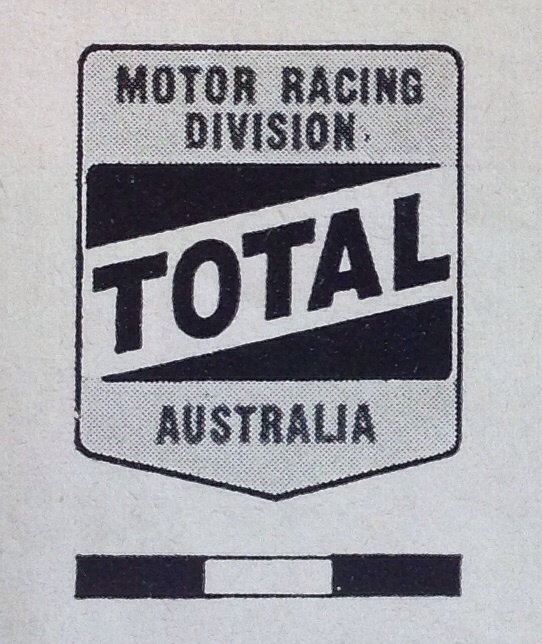 Of interest to Australian enthusiasts is Adelaide born, but British domiciled Arthur Waite’s 3rd place in the ‘Saorstat Cup’ aboard his Austin, Captain Waite was the winner of the second Australian Grand Prix at Phillip Island in 1928. Caracciola’s margin was 8 minutes from Giuseppe Campari’s works Alfa 6C 1750 GS with Howe 3 minutes further back in his SSK- then Birkin’s Bentley Blower circa 35 seconds adrift of the SSK. Lord Howe togs up for the 1931 Irish GP/ Eireann Cup in which he was 5th and set fastest lap in his Mercedes Benz SS. The winner was Sir Henry Birkin’s Alfa Romeo 8C2300. An amusing sidebar is this snippet from the Adelaide Advertiser’s report of the race in its 9 June 1931 edition ‘…Birkin’s car, made in Italy, was turned out for the race only by the intervention of Mussolini, who said that, as an Englishman had honoured Italy by ordering an Italian car for an English race, the Alfa Romeo company should provide a double-shift to complete the job. These shifts were necessary because this company is making also the engines for the Italian Schneider Cup planes’, the report concludes. Alfa went to great lengths to get the car to the race in time, factory race mechanic Alessandro Gaboardi accompanying Clive Gallop, a member of Birkin’s team in driving Vittorio Jano’s brilliant 8C2300 from Portello to Phoenix Park and then sat alongside Birkin during the race. The RAC International Tourist Trophy, a race for ‘production sports cars’ was held from 1928 to 1936 on a 13.67 mile road course on the outskirts of Belfast at Ards, eight spectator fatalities after a car crashed into the crowd in 1936 caused the events demise. 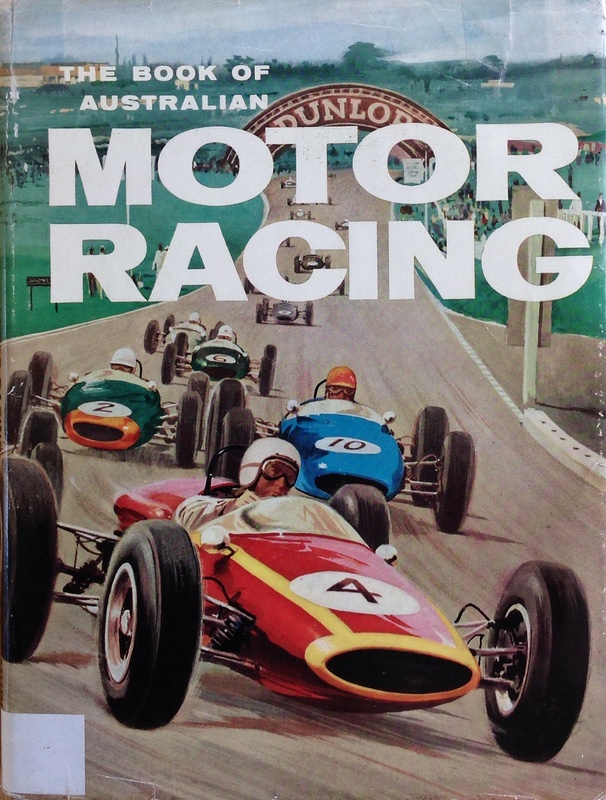 I didn’t ever own it but it was one of a very small number of racing books in Camberwell Grammar School’s library when I started there, aged 12. Having only recently become interested in racing I was like a sponge for information. 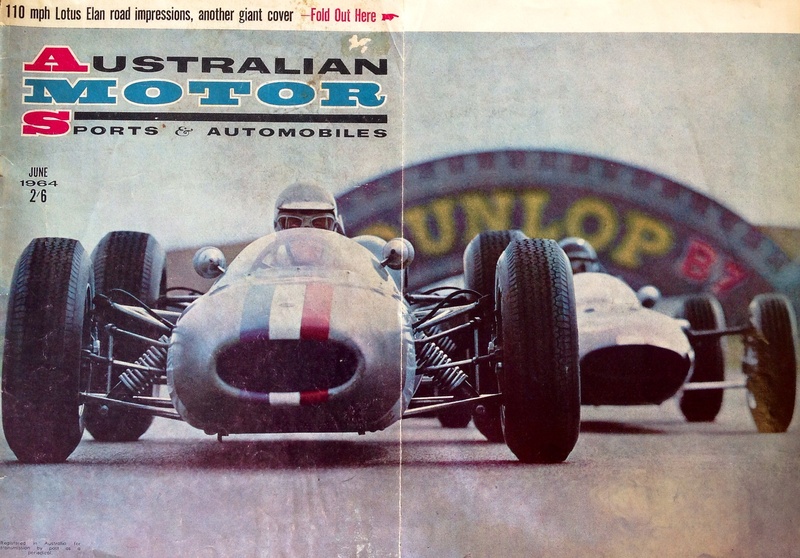 What was significant about this tome is that it was written by a talented journalist, Bill Tuckey, who edited both ‘Wheels’ and ‘Sports Car World’ magazines, the latter became one of my monthly bibles along with ‘Racing Car News’. 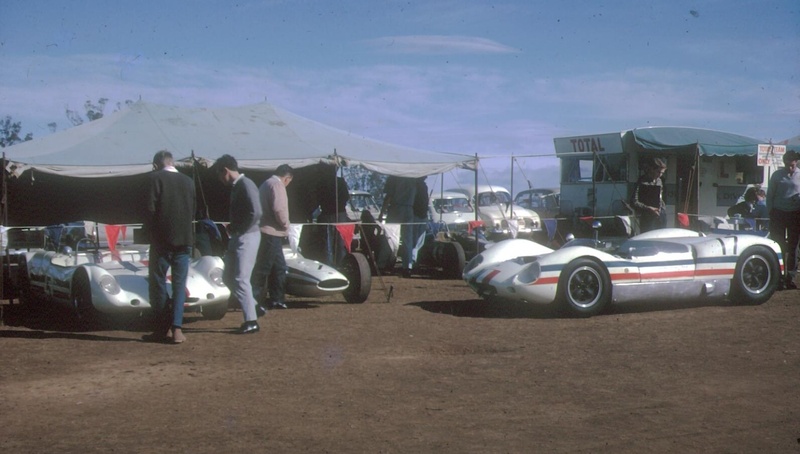 The book covered a very broad canvas comprising all the Australian Grands Prix, portraits of the champion drivers at the time (the early sixties) as well as our circuits and the round Australia epic trials of the fifties. It was a great read and provided important historical context for my contemporary obsessions at the time which were F5000 in Oz and F1 ‘over there’. I must suss it on Ebay. Anyway, I thought I would share the cover art, the circuit depicted is Sandown, the Cooper T70 like car is just hooking into Shell Corner or Turn One, its vanilla name these days. By 1933 Mussolini had been in power in Italy for 11 years, he was elected Prime Minister in 1922, he established a dictatorship in 1925. 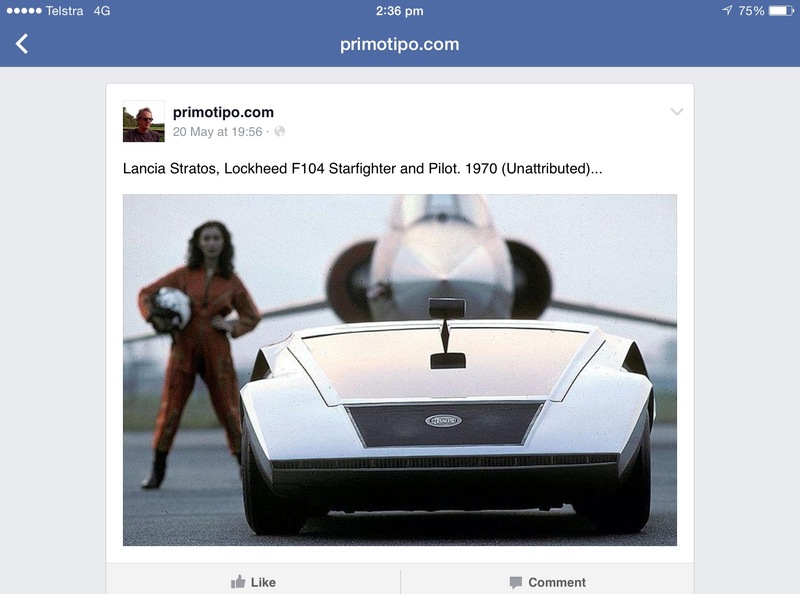 It’s said he was a motor racing enthusiast, no doubt the public relations benefits of attending high profile events such as the Coppa Acerbo did not escape him. 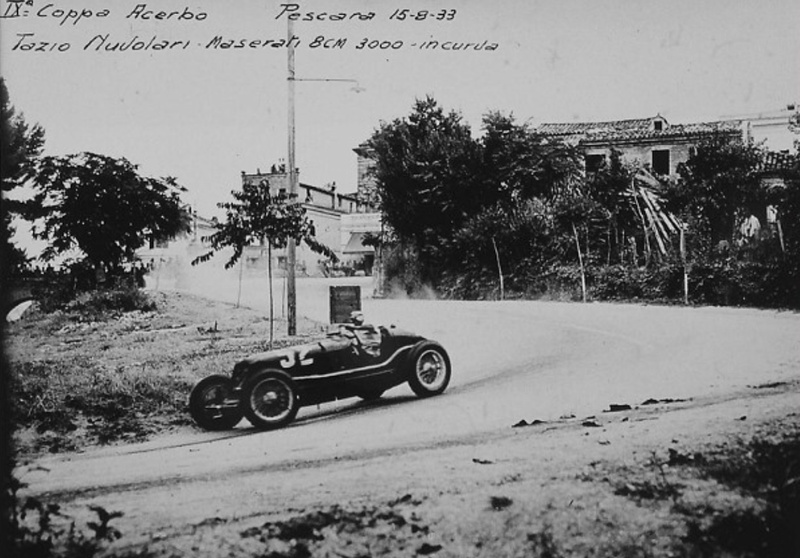 The 15 August 1933 Coppa Acerbo was an important race that year given changes to the driver line up amongst the Italian teams, some very shortly before the event which gave added interest to the meeting. Alfa Romeo withdrew from Grand Prix racing at the end of 1932, electing to leave its superb monoposto, the first single-seaters in Grand Prix racing, Tipo B’s behind the closed doors of its Portello works leaving the new Scuderia Ferrari to race older Alfa Romeo Monzas. No amount of remonstrating with Alfa Romeo management by Ferrari was successful in releasing the quicker, newer design. Not early in the season anyway! 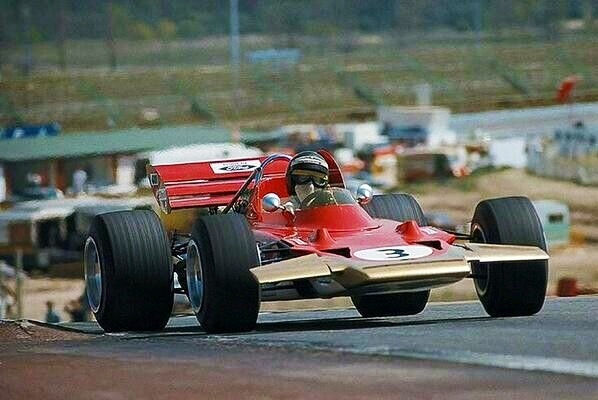 As a consequence Ferrari was unable to keep his team together as his drivers sought more competitive mounts. 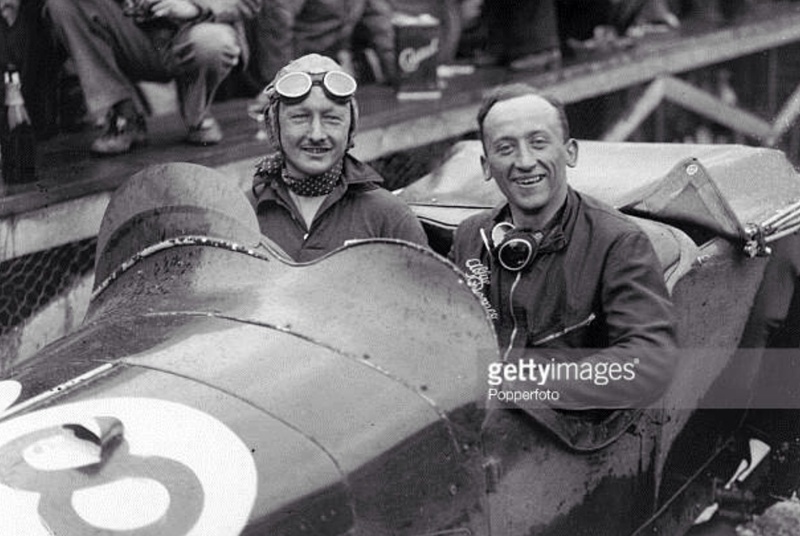 Rudi Caracciola and Louis Chiron formed Scuderia CC, although Louis returned to the Maranello fold later in the year. Taruffi left too, having been forced to cede his car to Nuvolari whilst leading the French GP. Then, after an argument with Ferrari post the controversial Tripoli GP Nuvolari departed, taking his friend Borzacchini with him. Giulio Ramponi went to join Whitney Straight’s private team to add to the rout. Ferrari fought back of course, hiring Fagioli who was not keen on seeing Nuvolari take the #1 seat at Maserati with Campari also joining him at Scuderia Ferrari. Eventually Ferrari succeeded in having the Tipo B’s released to him in time for the Coppa Acerbo and then the Maserati runners were at a disadvantage! So…the Coppa Acerbo loomed. Fagioli had defected from Maserati as did Campari, back to Scuderia Ferrari following a disappointing race at Reims 9 days before. Nuvolari and Barzacchini raced 3 litre straight-8 Maserati 8CM’s as independents. Taruffi too raced a Maserati 8CM in Pescara for the first time. Scuderia Ferrari entered eight cars; 2 1932 2.6 litre straight-8 monoposto Alfa Romeo Tipo B/P3 which, as noted above, the Alfa factory had just released to Ferrari for Campari and team leader Fagioli. 2.6 litre Monzas were prepared for Trossi, Carraroli and Tadini and 2.3 litre Monzas for Brivio and Comotti. Five Bugattis were entered, not the new 2.8 litre Type 59 which did not appear until the last GP of the year in Spain, but 2.3 litre factory T51’s for Dreyfus and Varzi’s privately entered car. Also Bugatti mounted was Earl Howe and Brunet in Type 51’s with Mille ‘Helle Nice’ in a 2 litre Type 35C. All were straight-8 engines of course. Famous agriculture minister Giacomo Acerbo named the race in honour of his brother Captain Tito Acerbo, a decorated war hero killed towards the end of the war in 1919. The first event was held in 1924 and won by Enzo Ferrari in an Alfa RL Super Sport after a tyre failure befell Campari who was well in the lead in a similar six-cylinder works Alfa to Ferrari’s. The 25.5Km road course was a daunting one set in the Abruzzi Mountains. The track was loosely triangular in shape like Reims, starting in Pescara on the shores of the Adriatic. After a 1 Km stretch the road turned inland for about 11 Km along a winding road into the Abruzzis. It plunged through the forests and hill villages of Villa Raspa, Montani, Spoltore, Pornace and Villa St Maria rising 200 metres from the coast. The racers then descended to Capelle sul Tavo and then after a hairpin into the 11Km long Montesilvano downhill straight to the coast at very high speed. The straight was followed by a fast right turn at Montesilvano railway station which led onto the Lungo Mare Straight along the coast back to the start/finish line in Pescara. Nuvolari’s fastest lap in the 2.6 litre Alfa Tipo B monoposto in 1932 was 147Kmh. The event comprised 12 laps, a total of 306Km. The fast boys in practice were Nuvolari’s Maserati 8CM, Campari’s Tipo B and Varzi in another Tipo B. Varzi was given the car to test by Ferrari but elected to race his Bugatti, Molsheim being not keen on the notion of Achille racing the Alfa. 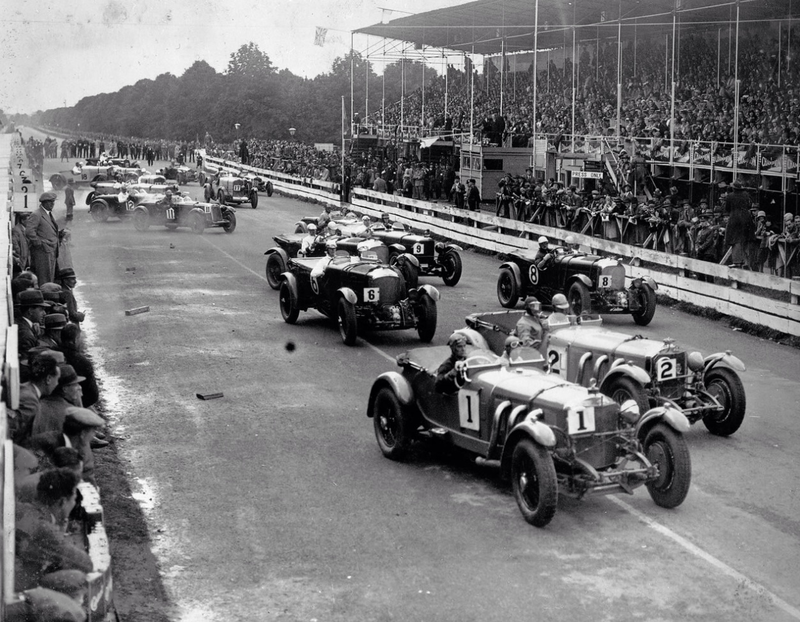 The grid was determined by ballot of course, over 50000 spectators lined the course in anticipation of an epic battle amongst mainly Italian drivers. Two races were run during the carnival, one of 4 laps for 1100cc cars which was won by Whitney Straight’s MG K3 Magnette. It was an exciting race, Straight’s margin at the events completion only 1/5 second from Barbierri’s Maserati. 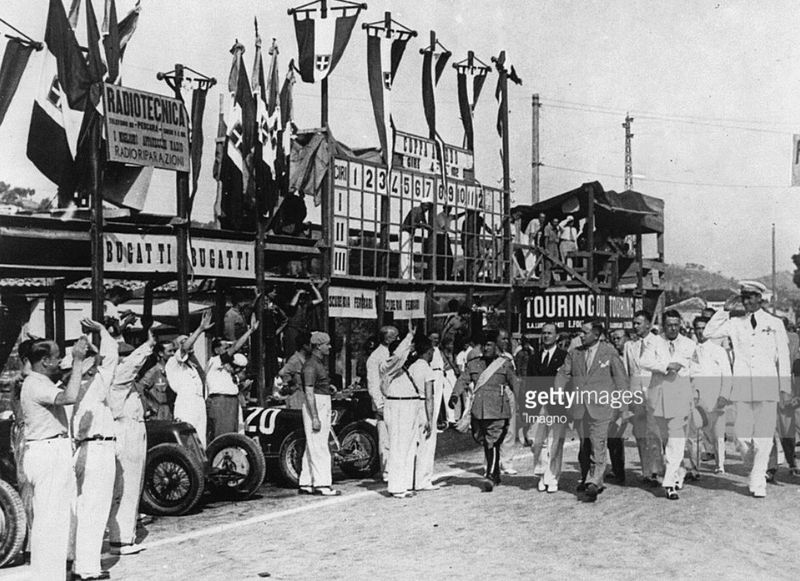 Duke d’Aosta, first cousin of the King of Italy, gave the starting signal for the main race for cars of unlimited capacity at 10am accompanied by His Excellency Acerbo. Only 16 cars took the start with many of the entries failing to materialise. Campari’s red monoposto Alfa was in front followed by Varzi’s Bugatti, Howes green Bugatti T51 and Dreyfus in the factory T51. Soon the faster cars ballotted towards the rear started to come through the field. As they crossed the line at the end of lap 1 Campari’s Alfa was right behind Nuvolari’s Maser, this relentless scrap was to be the pattern of the challenging race. The first lap took Tazio 11m03sec, then came Campari, Taruffi 2s later, then Fagioli and Varzi. Zehender Maser 8CM, and Dreyfus were 6th and 7th already 43 seconds behind the two leaders. Whitney Straight and Ghersi, Alfa Monza 8th and 9th, a second apart were 56s behind the leaders. Borzacchini was stranded only 12Km from the start with a seized driveshaft universal joint on his Maserati 8C3000 gearbox. He borrowed a bike and pedalled slowly back to the pits to the amusement of the vast crowd. The spectators were more thrilled though, by the dice between old rivals Nuvolari and Campari. They swapped the lead but were always able to see each other. Behind them were Taruffi 3rd, Fagioli, Varzi and Dreyfus. Nuvolari and Campari raced wheel to wheel on laps 4 and 5, on lap 5 Nuvolari passed Campari and this time began to pull away. When the Mantuan finished lap 6 Campari was 8s back from Fagioli, Taruffi, Varzi, Dreyfus, Zehender and Howe. 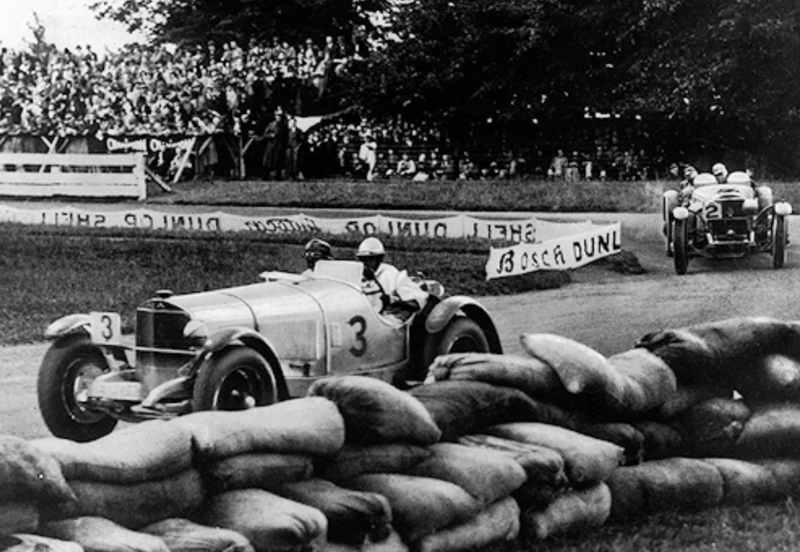 After 8 laps Nuvolari had extended his lead to 16 seconds and was on course to win the race. Sensation happened on lap 9 when Campari, still chasing Nuvolari, left the road near Spoltore and was thrown from his Alfa, he was fortunate to be only lightly injured. Earl Howe was quoted in ‘The Motor’ October 1933 ‘Campari took a corner too fast, his car ran up a bank and was overturned, fortunately he was not badly hurt. I nearly hit his car, the presence of which i had no warning’. 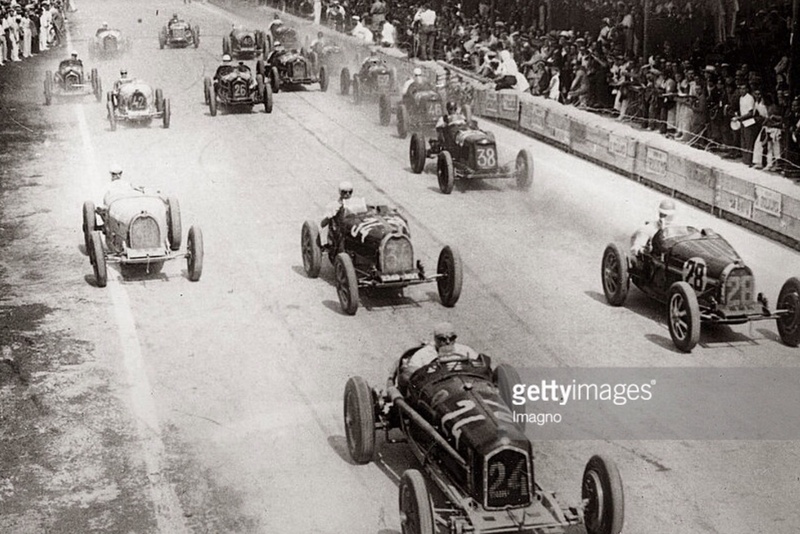 Fagioli then inherited 2nd but he was 1m11s behind Nuvolari who completed the 9th lap from Fagioli, Taruffi, Varzi, Dreyfus, Zehender, Howe whilst Pelligrini, Alfa Monza, Grosch and ‘Helle Nice’ were already lapped. Straight had retired his Maserati 26M on course with mechanical failure. Nuvolari sensibly eased his pace on lap 10, allowing Fagioli to draw within a minute of him, but there was further sensation at the end of lap 11 when Luigi crossed the line in Pescara ahead of Nuvolari! 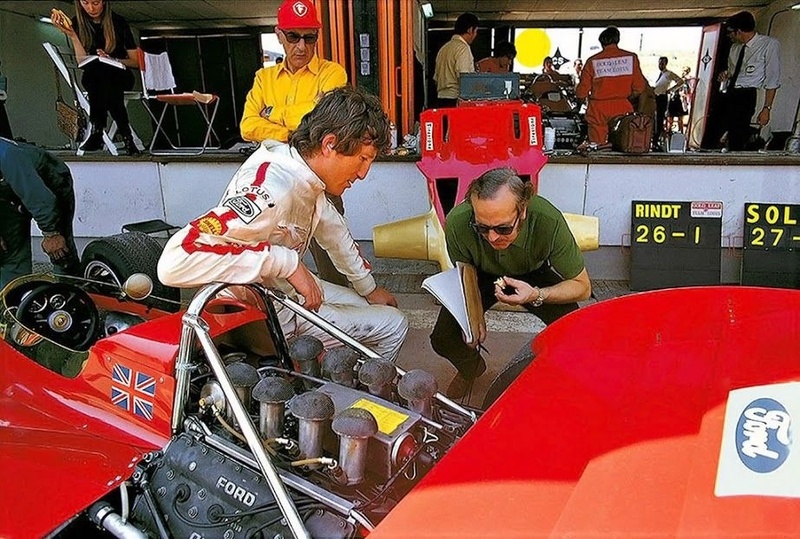 He too, like Borzacchini, had a gearbox driveshaft universal joint seize and was slowly making his way to the pits to rectify it. Career Maserati mechanic/engineer/test driver Guerino Bertocchi poured a bucket of water over the hot, smoking driveshaft to cool it down and Nuvolari resumed the race in a great cloud of steam and smoke but his countryman was well gone. 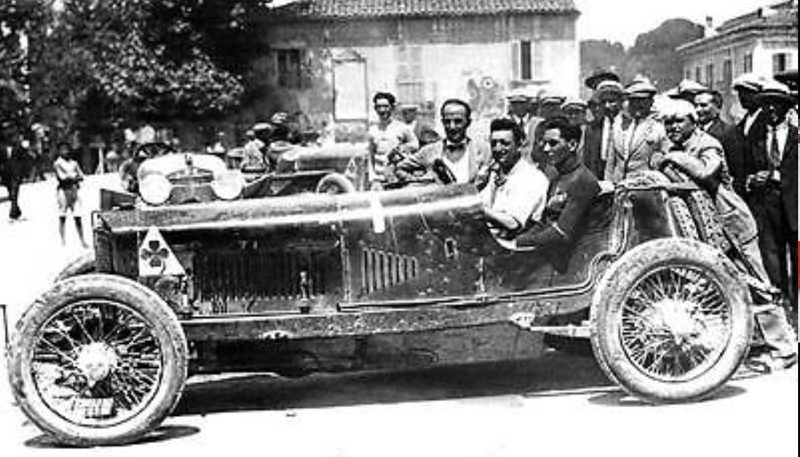 Tazio drove like only he could and saved 2nd place from Taruffi in the other Maser 8CM monoposto. The spectators gave Nuvolari real shouts of acclamation and appreciation of his wonderful drive as the moral victor of the contest. Automobil-Revue reported that Fagioli shouted, as the Italian National Anthem was played- ‘But the true victor is Nuvolari’, the great man set a new lap record on lap 7 of 10m31.8s. Varzi was 4th some 4m25s back, Bugatti T51, then Howe 14m18.4s behind Fagioli, also aboard a T51. Pellegrini, Alfa Monza had been lapped once and and was flagged off as were Grolsch, Alfa Monza and Helle Nice, Bugatti T35C lapped twice and thrice respectively. Tazio Nuvolari made the Maserati 8CM sing when he first got his hands on it, it was not the first time the great man achieved results with a car lesser mortals struggled to match. The engine and gearbox was great from the start, it seems probable the M26 car first raced with the 3 litre straight-8 at the 1932 German GP, but this cannot be confirmed. 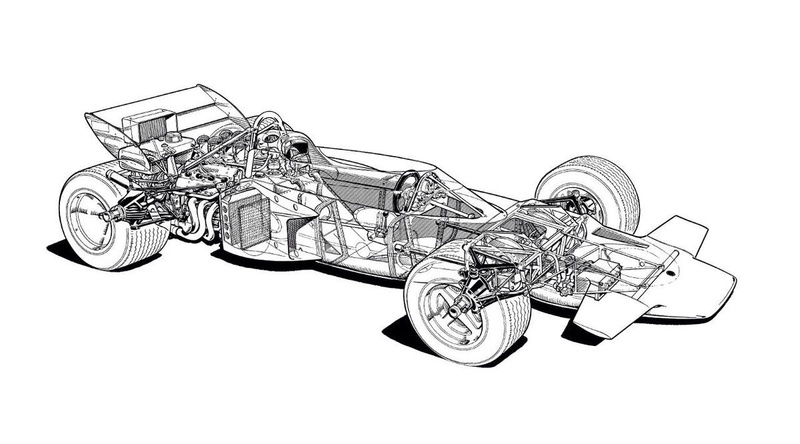 The 8CM was a more powerful car than Scuderia Ferrari’s bored out Monzas, and more than the equal of Alfa’s Tipo B in terms of power if not the handling and ability of the car to put its power to the ground courtesy of brilliant designer Vittorio Jano’s ‘bifurcated’ twin driveshaft rear end. The Tipo B/P3 was ‘the car’ of the 1932 to early 1934, ‘pre Silver Arrows’ phase! Maserati designed a beautifully narrow monoposto which presented nicely to the airstream but the period typical 8CM girder chassis lacked structural rigidity. This was addressed by Nuvolari on the eve of the Belgian Grand Prix, his first GP in the car. 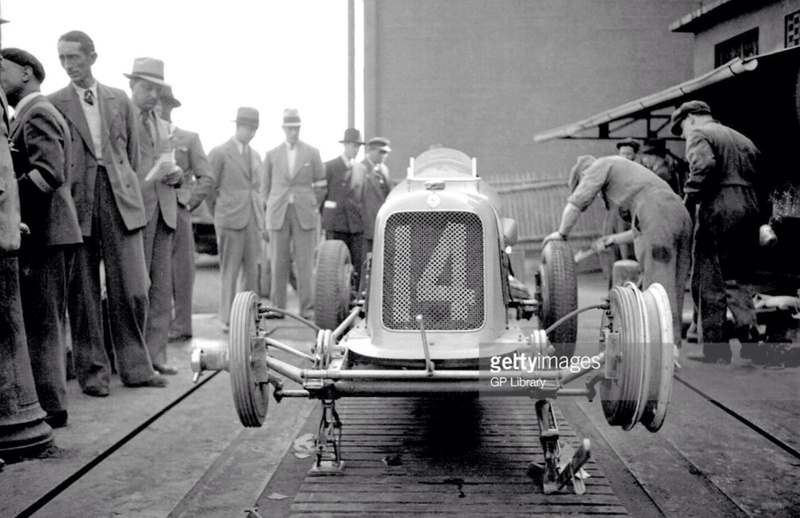 Nuvolari, after driving the car in practice and being disturbed by its behaviour at speed, diagnosed the chassis shortcomings and took the car to the Imperia car factory at Nessonvaux where additional bracing was added to the chassis and the problem was solved- he won the Spa race. 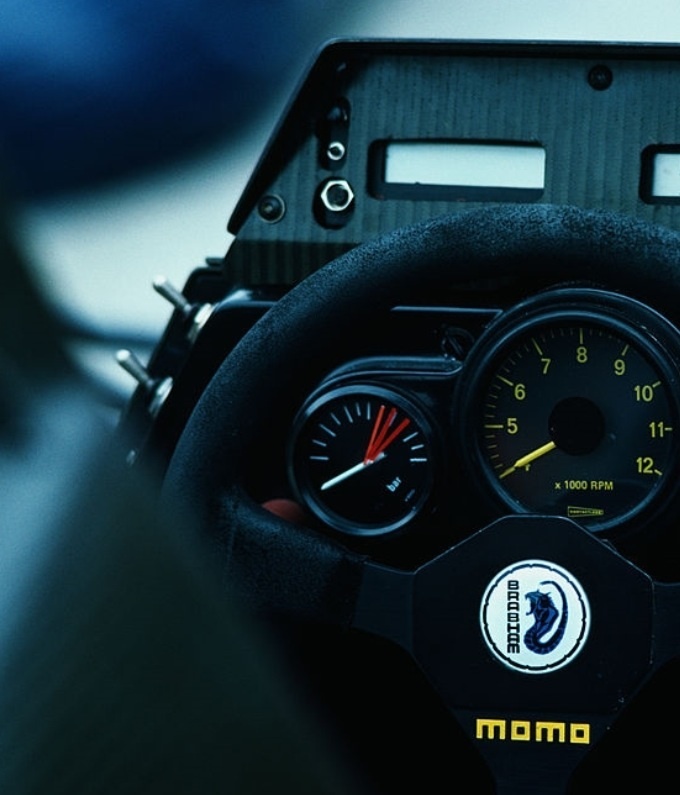 From that point on the 2991cc, cast iron, DOHC, two valve, Weber (or Memini) fed, Roots supercharged straight-8, giving circa 250/280bhp@5800 racer became a very effective tool, and not just in Nuvolari’s hands. 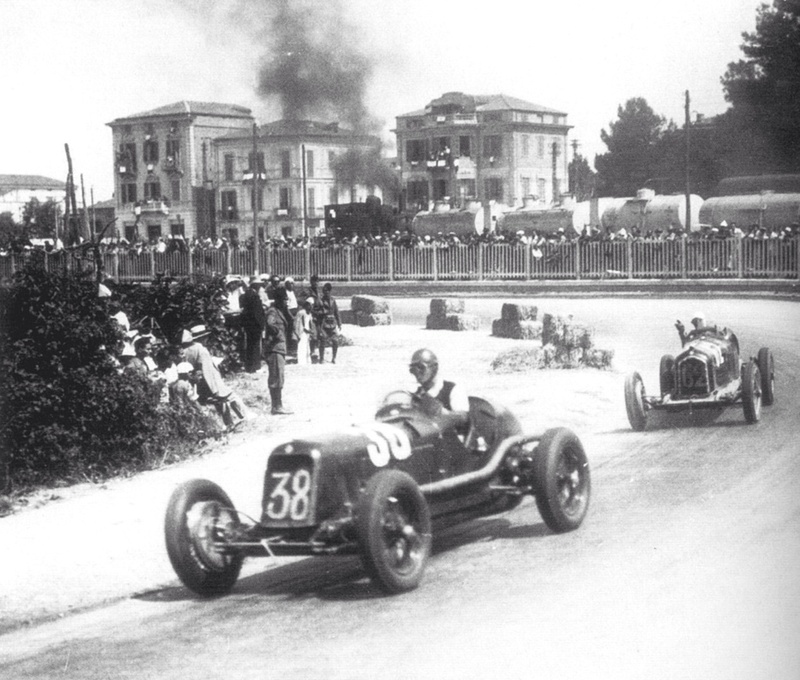 In 1933 Campari won the French GP in an 8C3000 before decamping to Scuderia Ferrari. Nuvolari took wins in the Belgian GP after his last minute chassis mods and in the Coppa Ciano and Nice GP. 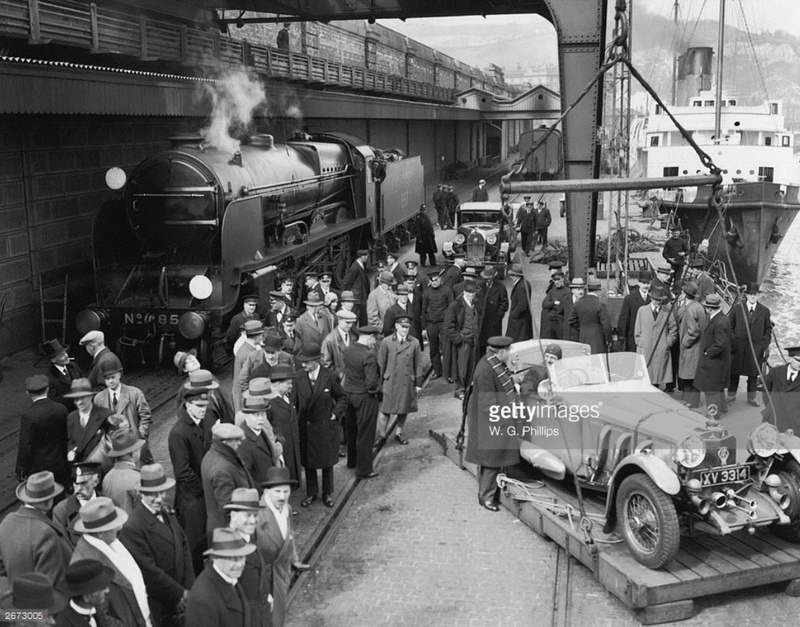 It is sad that Alfieri Maserati died during kidney surgery (on 3 March 1932) but he bequeathed his firm two wonderful engine designs in both 1.5 litre 4 cylinder and 3 litre 8 cylinder, DOHC, supercharged layouts before his passing. 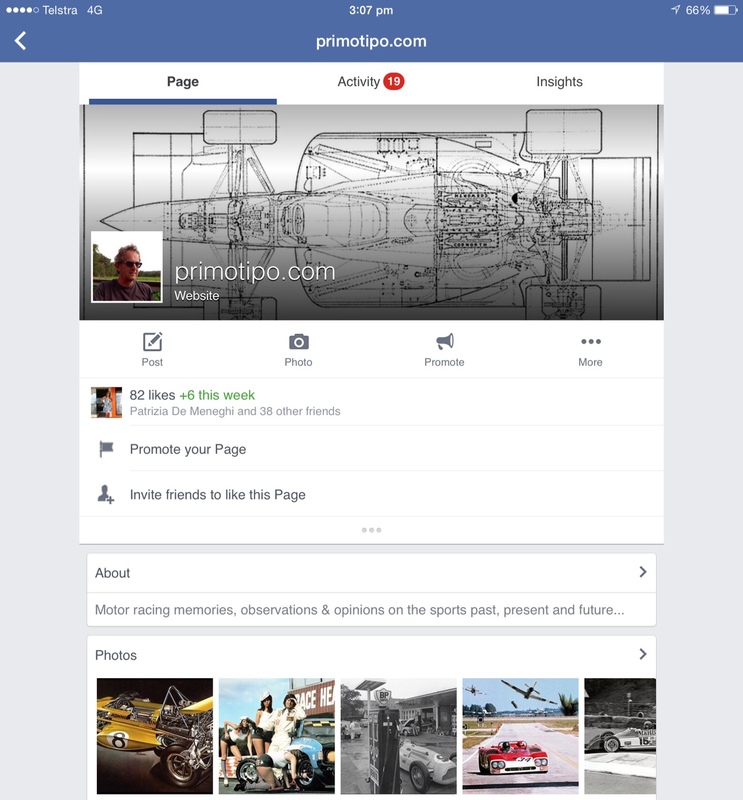 Winning designs for both the Voiturette and Grand Prix classes. The 8CM was also a very commercially successful car for Maserati, 19 were built in total, the car became a tool of choice off the back of its 1933 performances for privateers who sought its blend of performance and reliability. Alfa chose not to sell the Tipo B to privateers, having initially announced they were building 25 cars for sale, that decision very much to Masers benefit when drivers sought mounts for 1934. 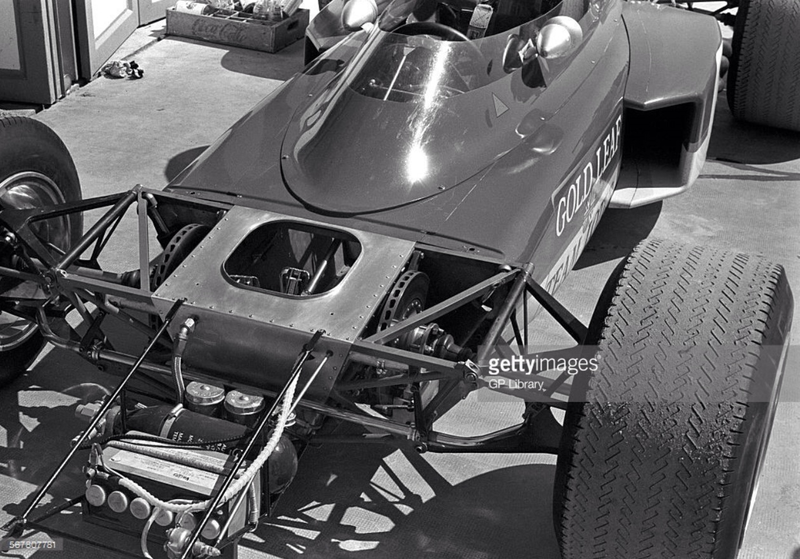 To comply with the 1934 ‘750 Kg Formula’ regulations the chassis was widened from 620mm to 850mm to facilitate fitment of bodywork to comply with the new cross sectional regulation requirements, with the package otherwise remaining the same. The 8CM was initially a ‘pork chop’, tipping the scales at more than 750 Kg but some judicious weight saving made the car comply. 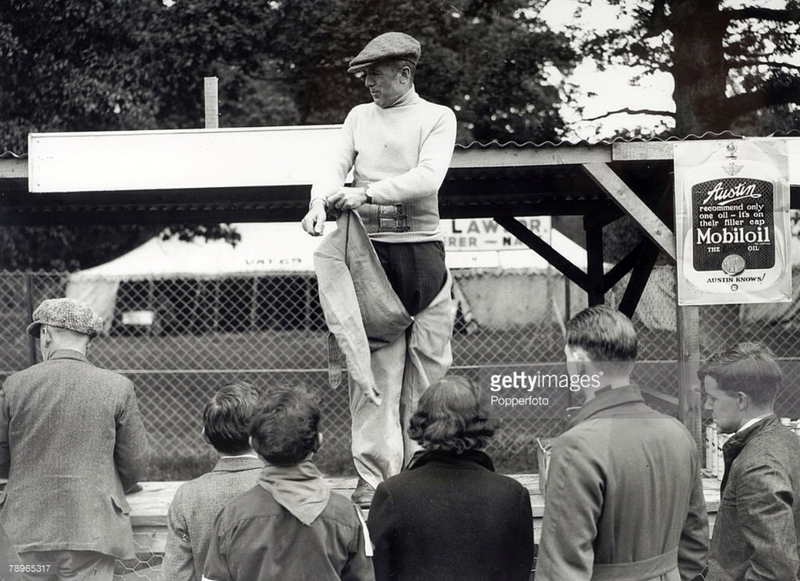 In terms of 1934 8CM wins, Benoit Falchetto won both the GP Picardie and GP de L’ V.M.F. at Montlhery and Phillippe Etancelin the GP Dieppe. 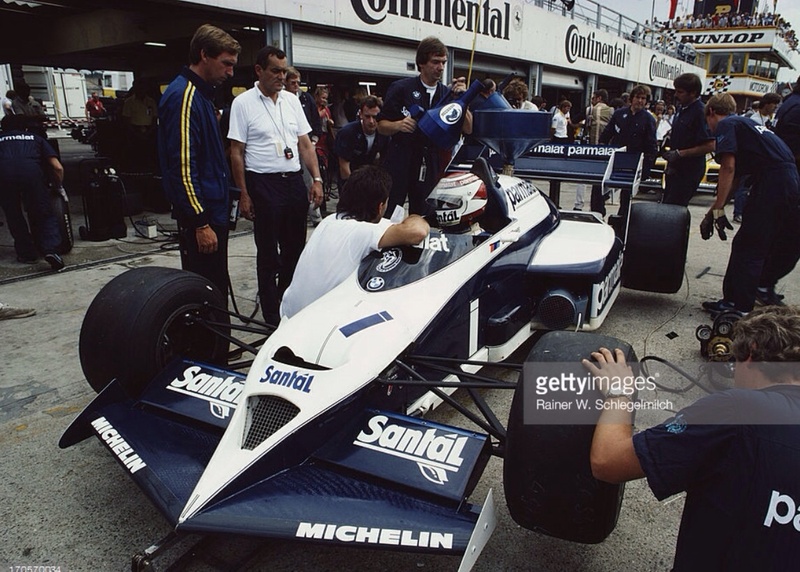 Whitney Straight had much success with his modified cars at home, winning the Donington Park Trophy and the Mountain Championship at Brooklands and right at the end of the year, the South African GP. Straight also took a heat win in the GP Vichy. Later in the year Maserati’s factory team focus switched to the new 3.7 litre 6 cylinder engined 6C34, the new engine fitted into the 8CM chassis. Tazio won the Circuit of Naples and Circuit of Modena in these cars that October, but the model was not an outright contender. The net result was that Nuvolari made the decision to join Scuderia Ferrari for 1935. Maserati’s 1935 challenger, the 4.8 litre V8 Maserati RI made its GP debut at Marne that July but was never fully developed when Maserati lost interest in GP racing, it was an unequal struggle after all, the Silver Arrows were well into their stride by then, Tazio Nuvolari’s stunning German GP win aboard an Alfa Tipo B duly noted!.